Chinese mainland shares closed lower on Monday, the first trading day after Saturday's announcement of banking veteran Yi Huiman as the new head of the China Securities Regulatory Commission (CSRC), the country's securities regulator. A multitude of retail investors anticipating the onset of a bull market after getting a new CSRC boss, were disappointed. Their disappointment has grown over the last few days, with the market hit by warnings on 2018 results issued by an increasing number of companies listed on the mainland markets - notably an about-face by some companies that suddenly notified investors of massive losses after having previously disclosed decent earnings for the past year. Bearish news as such that point to more fundamental equity market problems could turn a place that carries the expectations of investors hoping to benefit from economic growth and business expansion into a minefield. This is supposed to serve as a pressing reminder of the need for broad-based institutional efforts to put in place an efficient and well-regulated market. Such long overdue efforts matter considerably, not just to local retail investors, but foreign institutional investors looking to the A-share market. That means much more than a major management change, however auspicious the new boss's name might imply. The new stock market regulator's name, literally easy, able, and full, has some believing the market is primed for a bullish rally that might prompt investors to be in a full position. A tough start to Yi's tenure as the new CSRC chairman is reminiscent of his predecessor's rocky beginning to the role. In late February 2016, Liu Shiyu, another banking veteran, replaced Xiao Gang, the man behind the short-lived circuit breaker mechanism. The automatic trading halt which triggered sharp market selloffs was suspended only a few days after it came into effect on January 1, 2016. Liu started his term as head of the CSRC on a mixed note, with the flagship Shanghai Composite Index finishing up 2.35 percent to 2,927.18 points on the first trading day of his tenure, before plunging 6.41 percent to 2,741.25 points on the fourth day. 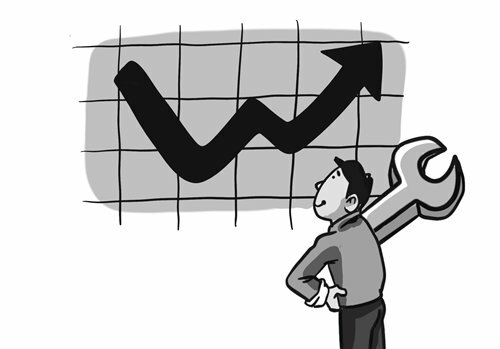 On January 24, the last trading day during his term, the Shanghai index edged up 0.41 percent to 2,591.69 points. That said, throughout Liu's nearly three-year stay in one of the country's thorniest jobs, the benchmark index was down more than 10 percent. In comparison, the Chinese economy posted an annual expansion of 6.7 percent, 6.9 percent and 6.6 percent from 2016 to 2018. With the mainland market offering mostly a long side approach to stock investment, the numbers suggest bruising losses for many investors. Over the course of last year, A-share investors lost 100,000 yuan ($14,888.50) per capita, according to media reports, while the Shanghai index shed nearly 25 percent. In fairness, Liu's push for a crackdown on insider trading and stock manipulation, among other regulatory efforts, helped to clean up the market tarnished by stock frauds and other irregularities. There were also efforts during his tenure to improve the regulatory framework for market discipline such as the May 2017 announcement of changes to the rules governing shares offloading by major shareholders and management envisioned to enhance protection for smaller investors. Undeniably, the nation has also made big strides toward opening the securities market wider to foreign investors: foreign individual investors have been allowed to trade A shares plus the recent decision to double the quota for the Qualified Foreign Institutional Investor (QFII) program to $300 billion. Nonetheless, the deepest impression Liu has left is a paternalistic, mercurial approach to regulation, as exemplified by the frequent, discretionary issue of special trading halts. The quickened pace of IPOs during his tenure has also stirred contentions. It seems that what was essentially missing in stock market reforms during Liu's term was an endeavor to address the more fundamental issues, markedly the absence of a securities class action lawsuit system and rules that provide especially smaller retail investors with a way to claim compensation in case of stock frauds. For instance, following a scandal over falsifying data for a rabies vaccine uncovered last summer at Shenzhen-listed Changsheng Bio-Technology Co, the country's drugs regulator in October slapped penalties totaling 9.1 billion yuan on the vaccine maker while the CSRC said in a separate statement on the same day that it had also imposed a fine of 600,000 yuan on the company. The troubled vaccine maker received a notice of mandatory delisting from the Shenzhen Stock Exchange in December, arguably an indication of the market's evolution toward a healthier trading environment. However, investors hit with a colossal slump in the company's shares that fell to a paltry 2.24 yuan by the market close on Wednesday from nearly 25 yuan before the scandal was made public in mid-July, 2018, seem to have no choice but to swallow their losses incurred by the scandal. The detonation over recent days of financial disclosures by many firms listed on the mainland markets apparently has pushed investors to the brink of a breakdown. Through Tuesday and Wednesday, roughly 120 companies, out of a total of nearly 3,500 A-share companies, reported estimated losses of over 100 million yuan for 2018, and about 60 of them reported estimated losses going north of 1 billion yuan, according to incomplete statistics revealed late Wednesday by online financial information provider Hithink Flush Information Network Co. In a filing on Wednesday, Shenzhen-listed network game firm Dalian Zeus Entertainment Co estimated its 2018 net profits would dive by 815.97-864.95 percent, pushing the company with an overall market capitalization of 4.41 billion yuan by Wednesday's market close into losses of 7.3-7.8 billion yuan. The company, whose shares are included in the list of securities eligible for trading under the Shenzhen-Hong Kong Stock Connect scheme, has thus far topped the loss rankings. In its previous estimate disclosed in late October, the company was expected to log net profits of zero to 509.84 million yuan for 2018. The about-face was explained in the Wednesday filing to be attributed to the unspecified macro policy impact and majorly a substantial decrease in the value of goodwill, meaning the fair value of its acquired assets is currently well below the purchase price. Also, a blacklist of 200 A-share stocks claimed to be circulated internally by an unnamed brokerage firm has gone viral on Chinese social media. Companies making the list, yet to be verified, were reportedly embroiled in either financial frauds or sharply decreasing goodwill value. The astonishing figures and disclosures are apparently indicative of deeper problems with the equity market, which will require an undaunted resolution to push for institutional reforms that can truly build a safety net for stock trade by both local and foreign investors. It is hoped that a revision of the nation's Securities Law that was among CSRC tasks when Xiao was the top securities regulator, as part of the intuitional reformist drives, can come to fruition under the purview of the new boss whose name might augur well for the creation of a well-functioning stock market in line with the economy's clout across the globe.